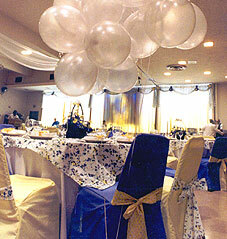 A simcha celebrated at Beth El-Atereth Israel is truly a special event. One can feel the warmth of the entire Shul community sharing the joy of the baalei simcha. There are several ways to celebrate simchas at our Shul. 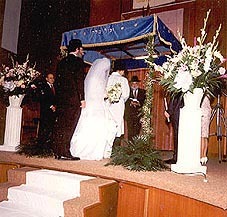 Many people sponsor a Shabbos or Yom Tov Kiddush. Set in the social hall adjoining our Shul, a Kiddush provides an excellent opportunity for people to enjoy some good food, while they mingle and greet each other and wish mazel tov to the baalei simcha. Those sponsoring the Kiddush have the choice of having an approved caterer take care of everything or of working with the Shul office to arrange for individual food platters, set-up, and other details. Some members like to celebrate their childrens birthdays or other special events in their childrens lives by sponsoring a Kiddush for children in our youth room after the Shabbos morning youth groups, or by providing Kiddush for the teens at their monthly teen minyan. This kind of Kiddush, with foods especially chosen for the tastes of the children, reminds the younger members of our Shul how special they are to all of us and how important they are to the present and future of our Shul. During the summer months, the weekly Seudah Shlishis on Shabbos afternoon has become a popular time to celebrate simchas at our Shul, from Shevah Brachos to special birthdays and anniversaries. Our Seudah Shlishis is noted for its warm and friendly atmosphere, as families sit down together to eat, chat, and sing and to enjoy every last minute of the waning Shabbos day with their friends. Before benching, we all enjoy an inspiring dvar torah delivered by one of our teens. 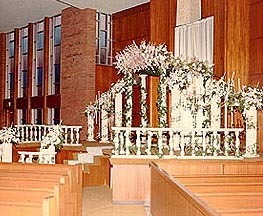 For weddings and other simchas taking place on weekdays, Beth El-Atereth Israels sanctuary and social hall provide a lovely and inspiring setting. For weddings, we have a brides room, the beauty of our sanctuary for the ceremony, and a social hall that can seat 200 with a dance floor. 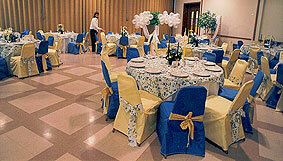 The Shul office will work closely with the baalei simcha to help make the simcha a smoothly-run and happy event. For more information on celebrating your simcha in Beth El-Atereth Israel, please contact the Shul office.